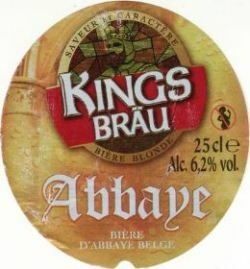 Brewed under licence from a Belgium Abbey. Robe blond orangée, presque ambrée, limpide, mousse éphémère et carbo faible. Nez levuré, corpulent. En bouche, une certaine sécheresse, qui prend le pas sur le corps, pourtant présent. Amertume assez faible cependant... Étrange. La levure est aussi présente. Pas ignoble, mais reste très bof. 50 cl. can. A clear golden coloured beer with a white head. Aroma and flavour malt, caramel, hops, straw a with a bitter finish. Can - clear light amber with small white head. Citrus/malt aroma - medium carbonation. Ok on tongue slight ting in mouth . Decent malty flavour. Ok nothing special. Origin: Can. Vessel: Goblet. Supplier: Intermarché (Lézignan). Rich and malty bite which dissipates quickly. Small off-white head over coppery-golden beer, clear, and lazily bubbling. Nose with caramel, CO², parsley, herbal and rainwater. Bitterish metallic, rather agressively toasted flavour with faint sweetness beneath. Sharp, agressive MF, fizzily carbonated and empty but for the caramel. Not one to make JPP happy... All the same, thanks for bringing, Stef! Bottled, thanks Bov! Hazy amber, small head. Aroma of sweet red apples, marzipan and caramel. Mid sweet with clean mouthfeel and medium body. Caramel and marzipan. Very slight salty bitterness with a whiff of metal.